Enhance your piano playing and awaken the natural player within you with help from this unique subliminal mp3 album. Are your piano lessons becoming more and more frustrating? Do you want to cut your learning curve in half? Do you want to stop struggling and learn things first time round? 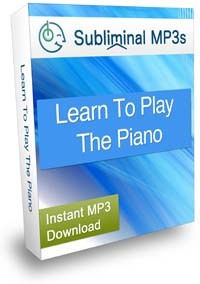 Do you want to learn to play the piano like the pro? It's great to be motivated and to have a strong desire to learn to play the piano, but when the lessons aren't going the way you were hoping it's not enough anymore. When you have to focus on every note and every move, you start over-thinking and over-analyzing it, and instead of enjoying the lessons you focus on the mistakes you make - and you soon start thinking that you'll never be a great piano player. That's all your mind's doing: it starts engaging in negative self talk, and you lose motivation and belief in your abilities. In order to awaken your inner musician you need to bypass these internal resistances and to reprogram your mind so that it starts thinking positively. Subliminal reprogramming is the easiest and most natural way to do that! Our subliminal suggestions will enter your mind to help improve your piano playing! This album is not magic or instant - you won't wake up one day and magically be able to play the piano, but it will enhance the rate at which you are capable of learning. It works simply as a learning aid to help you learn at an accelerated rate. You do still have to take classes and practice, but the album will make changes deep within your mind to help you take in the information easier and faster. First of all you should feel yourself more motivated than ever to practice. You will really enjoy your practice and you will be more committed than ever to reach a high level of piano. Second you will notice an improvement to your focus while you are practicing. You will be less easily distracted, and have a higher level of concentration generally. You ability to understand will improve. You will "get it" and understand musical information and structure - things which used to be complicated will sink into your mind and you will process everything much easier. Your "musical memory" will be boosted - your retention rate will improve and you will be able to remember what you have learnt much easier. If you are really serious about improving your piano playing then this album will give you the edge. It will give you a boost and make sure you stay committed, dedicated to your practice and improve to your full potential. This album is just one in our musical talent range, others include: learn guitar, drums, violin and more.